I don't know why I decided to name the set "We Are Young". It just felt right at the moment (x According to my We Heart It, I heart a lot of pictures of text tattoos. After endless hours on Deviant Art looking for fonts, I decided to do them. I've had these really for a while, but wasn't too enthusiastic about doing the in-game/preview picture which held me back from uploading them. Originally the feathers were going to be in one set and the text tattoos were going to be in a set of 10. But, I decided to split up the text tattoos and put them in different sets (I thought the preview pictures would look better that way). The tattoos come in a set of seven. The zip file includes each tattoo individually (labeled) and a file with all tattoos included. For more tattoo locations you can download XCAS by CmarNYC. - Since I'm not sure which fonts I used exactly, I have all the fonts I downloaded on my favorites. Thank you Kosmo ! I'm happy you like both of them ! Are you installing them correctly? You need to put them in your packages folder not your downloads folder. loveeeeee! im planning on getting a carpe diem tat in real life ^^ now my simmies can get one too thanks!!! Thanks heyheyouou ! Lucky, I can't get a tattoo )': lol. & It's always good hearing that they look nice in someone else's game ! I can see if I can convert package into Sims3Pack, but unfortunately, the Tattooinator only turns the tattoos into .package files. OMG I love it!!! It's really cool and stylish! Thank you JS (: It's always nice to get your comments ! i just find your blog, and your tattoos are amazing! Thank you Sims in Spring ! Awesome work. They look great. Very detailed and beautiful. Thank you. Thank you so much ScreechingViolence ! Thank you Blonde Chaos ! Vanity how did I miss these?!! These are awesome! Are they accessory tats or through the actual game tats? how can i download this to my the sims 3 game? You unzip the file(s) to your mods folder. Make sure you only install "Vanity Sims - We Are Young Tattoo Set ALL.package" if you want all the tattoos. If you just want certain ones the files are labeled so you can find them easier. please help me! i downloaded successfully the tattoos but when i put it on the body of the sims they are not visible! especially written!you only see many dots. I'm so sad, i like it so much! please answer me!! Hmm... How high is your detail settings? I know when mine is low, the tattoos aren't as clear as they would be if they were on a higher setting. How can I set a higher level? 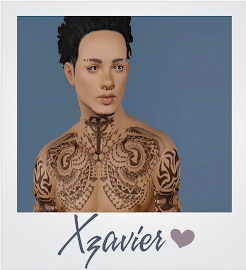 I am so glad I found these I have been looking for cool tats like these for my sims good work :) thank you very much! Thank you so much! It's beautiful. --beauty is in the eye of the beholder.